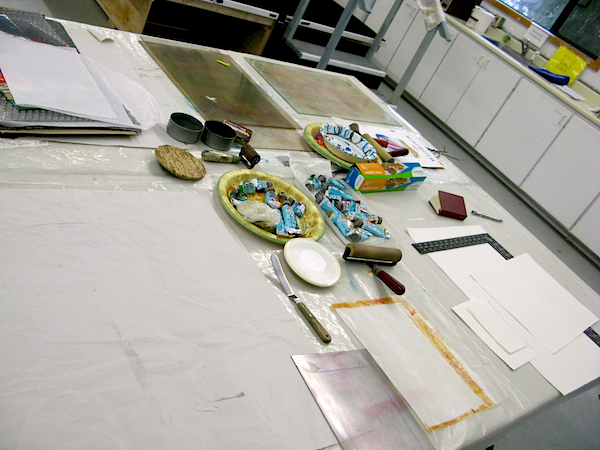 On Thursday I took an all day workshop with Patty Pico at Northwest Art School in monoprinting. For her particular method no printing press is necessary! And clean up is with simple soap and water. I worked nonstop all day with only a break for lunch. Time flew by and only then did I realize how tired I had become. I had so much fun and learned some wonderful techniques with new materials. If you're near Whidbey Island, she's giving another workshop in November. Below are some photos from the day. 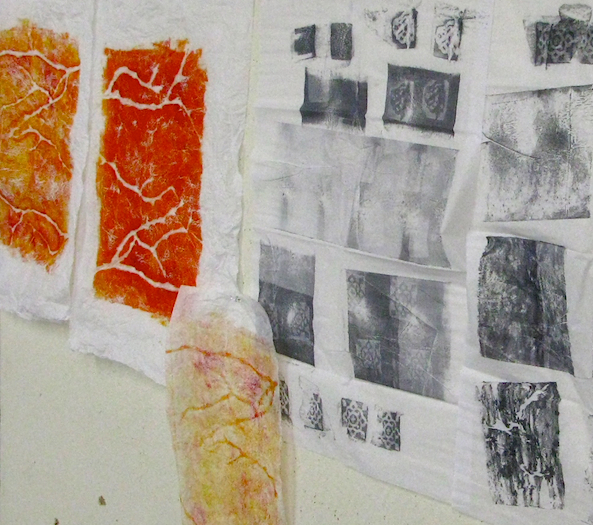 Above are some of the monoprints I did on tissue paper. I can use these in my collage works. 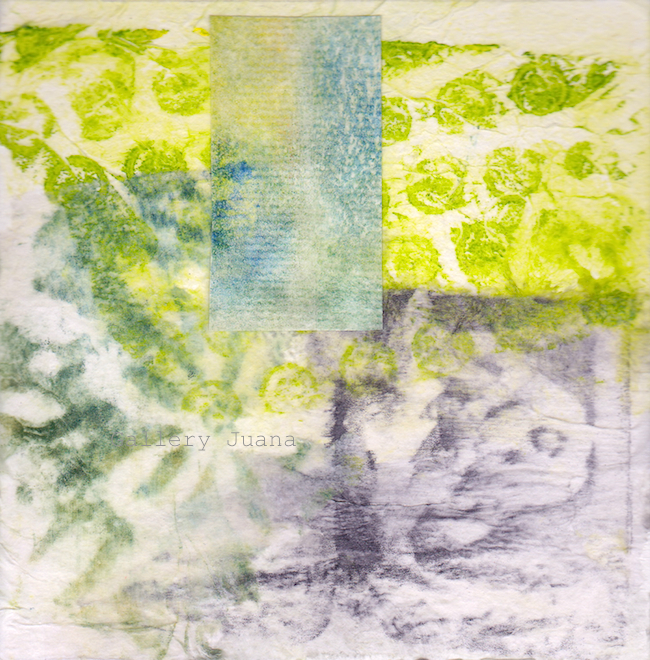 Although a printing press was not necessary, I got to do a monoprint on a press. What an incredible machine! It was pouring rain all day, but when I got home from the workshop (after an hour's drive), the rain was slowing. 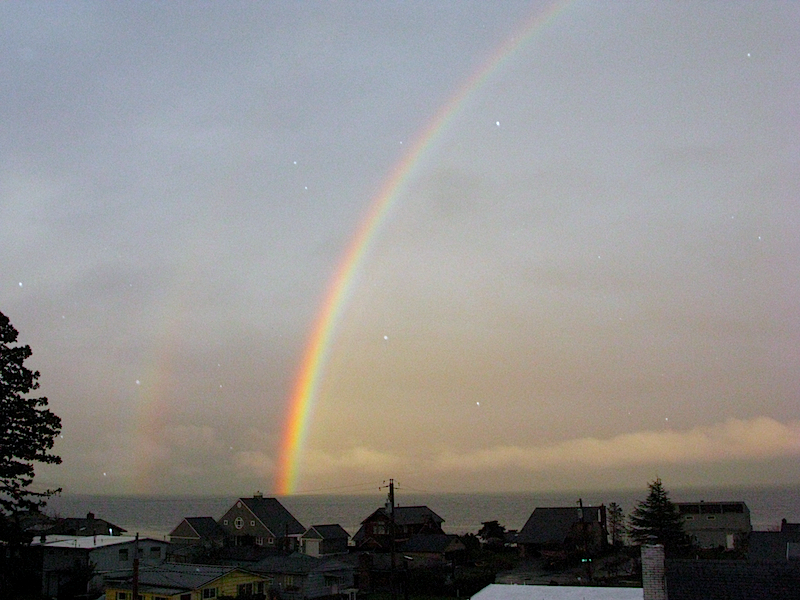 Above is the double rainbow that I could see from our rental house. The white specs are the raindrops that were still falling. And above is the collage I've started with the tissue paper monoprints as the first layer. I hope everyone had a good week. See you at bluechair's Sketchbook Sundays. Totally gorgeous...I love all the different patterns and energy..and especially the softness and diffusion of colors....beautiful! wonderful to see your prints and that you will use them to inspire you with collages and whatever you dream up. the photo is dreamy wonderful too. these are so soft and pretty! looks like a fun process! Sounds like you had a wonderful time. A day just making art is pure bliss. YOu made some beautiful materials. Sounds like a wonderful day! I love to create when it's raining.. or sunny, or anytime really, lol. I love your piece! And that rainbow... perfect end to a perfect day! looks like a great time...I had a similiar rainbow last week...it was magic. Oooh, what a beautiful double rainbow to see! The monoprint workshop sounds fun. Lovely start to the collage. 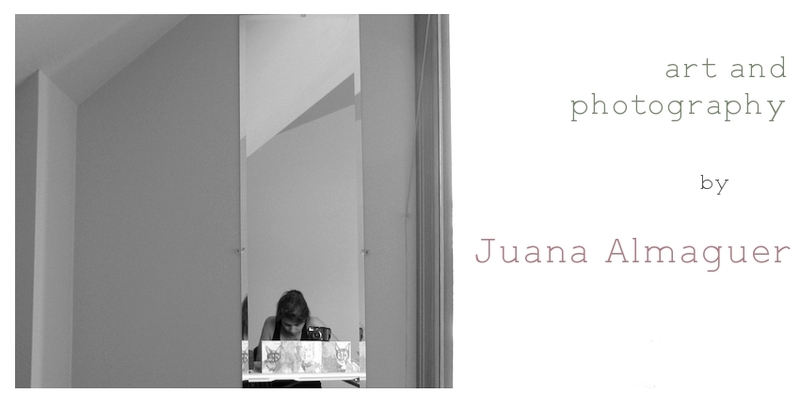 This is lovely Juana. I would like to know about other classes via email, since we live so close. Can you tell me where to find them? how interesting! looks like a fun workshop with great results! and your double rainbow is wonderful! Happy SS and beautiful rainbow! thank you for your lovely visits! I love the prints and the photo is great..I am glad you are finding inspiration in your new area.